Contact me about using IMPACT in my organization. Get updates for enrolling in our new course: Rapid Cycle Evaluation for Administrators. Send me a sample IMPACT report. Copyright © 2017 Lea(R)n. All rights reserved. LearnPlatform's IMPACTTM Analysis is used by K12 and higher education administrators to rapidly analyze individual edtech product utilization, pricing and student achievement data to inform instructional, operational and budget decisions. IMPACT reporting allows administrators to analyze edtech use, achievement and costs to know what's working for students and which adjustments need to be made to improve results. 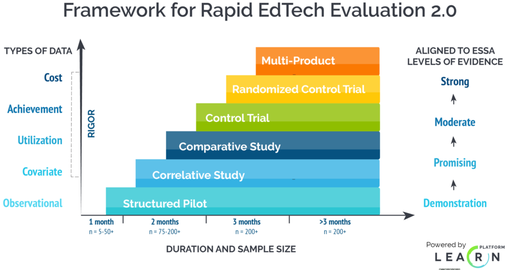 In addition to informing critical implementation and instruction decisions to better meet desired outcomes, LearnPlatform’s automated research design aligns to evidentiary standards outlined to meet ESSA requirements, showing program effectiveness measurement with IMPACT rapid cycle evaluation. Needs assessment and ongoing implementation measurements are essential components of ESSA and Title I funding allocations. This reporting also meets state-level requirements, like those of LCAP in California and the Digital Learning Initiative in Utah.